The 'Freshman 15' isn’t inevitable. Start the school year with the right mindset, and you can build a physique that will hold up even after you’ve paid off your loans. It's time to get freakin' jacked! You're ready to make it happen, and I'm ready to give you all the tools to make it happen by the end of the semester. Let's go! Not so fast, soldier. Back to the barricade. Many people mistakenly believe the fast track to muscle mass is simply an onslaught of curls, cable flyes, and protein. There's no doubt these can help you see some gains-especially if you've never employed any training or nutritional strategies-but if that's the extent of your plan, expect those gains to quickly come to a disappointing halt, or worse yet, vanish. What gives? And more importantly, what can you do about it? If you want to bulk up like an actor who prepares for a superhero role and loses it all after filming, you're reading the wrong article. However, if you want like to look like Captain America for life, here are four often-overlooked fitness strategies crucial for making your gains stick for good. Unlike the characters of The Matrix movies, we can't download an ideal physique on demand. The physiques that you find yourself envying on the street and in the gym took years to craft and build. Along the way, those people built some serious patience as well as serious muscles. A program may promise to deliver you jaw-dropping results in a matter of weeks, but it takes more time than that. That means committing to difficult workouts and healthy food when you're in a bad mood, when you feel like crap, when you'd rather be hanging out, and when you have other stuff to do. And if you like what you see when that program is done, you'd better get ready to start all over again. If you find yourself constantly checking yourself out in the mirror, waiting for slabs of muscle to load on your frame, I've got news for you, pal. Your mom was right: A watched pot never boils. We're after more … more muscle, more cuts, more everything! However, in the constant pursuit of more, we forget about the power of less, especially when it comes to picking a workout plan. 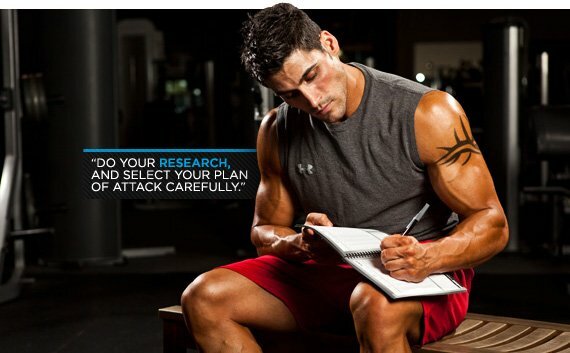 Let's say you're considering a plan which requires six days per week of training, a 6-meals-per-day eating schedule, and the mother of all supplement stacks-basically the entire Bodybuilding.com top 50 list. Allow me to make a prediction: With the rapid amount of changes, additions, and schedule changes in your life, you'll quickly find yourself dropping workouts, missing meals, and forgetting to take most of your supplements. Enter the power of less. What do you think would happen if you condensed your weekly training into three days, got your nutrition in 4-5 meals, and picked only three essential supplements? No doubt you'd have a better chance of meeting these scaled-back demands. Trust me, when it comes to making drastic lifestyle changes, easy is better. Gaining muscle or changing your physique is a demanding process. Jack up your chances of success by focusing your mental and physical energies on a few crucial things. Make them ones you know you can knock out of the park. Look around online, and you see plenty of people shouting that the path to muscle madness is with a tried-and-true training regimen and a mass-gain eating protocol. They're right, but regimens and protocols are just the beginning. You've also got be able to keep the faith. Do your research, and select your plan of attack carefully. Get freaky and obsessive about it. Because, once you have that strategy, you have to be able to believe in its efficacy all the way. Like, even after it stops being fun, which may be sooner than you think. Sorry to stack up a bunch of religious analogies here, but you are on a mission. You need to have unshakeable confidence that the actions you take, both in and out of the gym, will yield your desired results in the end. OK, you committed yourself to being patient, you set reasonable expectations around your lifestyle, and you picked and started your plan. Now it's time to go online and look at what everyone else is doing. You want to see how much they lift. Weigh their plan against yours. Look at videos of 1,000 exercise techniques that you're not doing … Right? Scouring the web night after night for the next workout, or eating plan, or miracle supplement, is only going to chip away at your steely mindset. You have a plan, so get on with it. Put your warrior helmet on, trust in your ability, and zero-in on the prize.